Isolation, fear, guilt, stress, and uncertainty. These are just a few of the feelings that family caregivers express when sharing stories online about their loved ones’ health. My family and I aren’t strangers to this same feeling of guilt. Since my grandfather passed away, I have had the same thought over and over; we could have done more for him. Unfortunately, I can’t go back in time and do things differently. But, I can work to make things better for other families going through the same situation. My Grandpa lived an hour away from my family’s home located on the South Shore of Montreal, and I was studying in Ottawa. My grandparents were happily married for 67 years and always took great care of each other. My grandpa had trouble with his hearing and my grandma with her vision, they were completing each other and supporting each other perfectly. One day, my grandpa had a stroke. He had never been separated from my grandma, so he was ready to do everything he could to go back home. After a few weeks at the rehabilitation centre, he went back home. My family was scared that something would happen again. I saw the struggle of my family providing care to my grandpa during this period; My dad would drive up to 2 hours a day to go visit him and make sure everything was okay. It became very heavy on my family. My family then decided to put my grandpa into a retirement home as my grandma and my family couldn’t provide him with all the support he needed anymore. 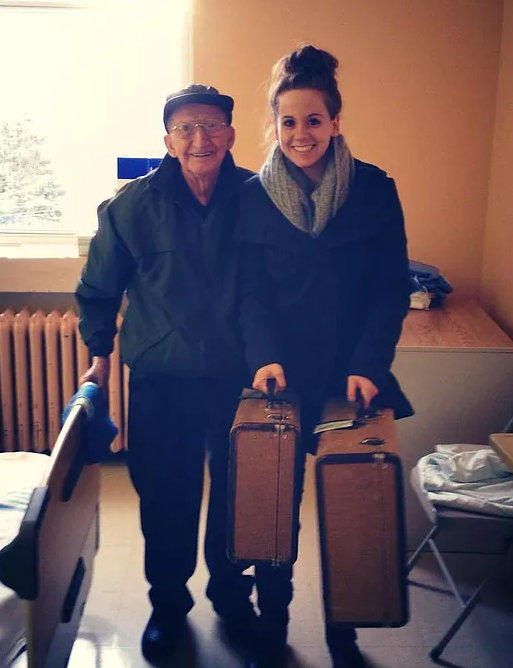 To our surprise, the day he moved into the retirement home, his health started decreasing. He had no way to communicate with my grandma as he couldn’t hear properly on the phone, he knew no one in the residence and didn’t see any motivation to get out of his room. His health got worse and worse, and sadly, few months later he passed away. We felt responsible for it. We felt like we could have done better to support him. I then started doing some research and realized that 43% of the seniors living in retirement homes are suffering of social isolation! Social isolation is as bad as smoking 15 cigarettes a day and it increases your chances of suffering of dementia by 64%. I had to take action to make sure this wouldn’t happen to other families like mine, so we created Welbi. My team developed Welbi in collaboration with senior health care researchers and professionals with the vision of transforming the way retirees are cared for so that they maintain a higher quality of life. We wanted to help families like mine gain better visibility into their loved ones' lives in retirement communities. Welbi’s software helps communities reduce social isolation by providing a rich and personalized experience to residents and their family members. The software provides alerts and recommendations to staff so that they can better tailor their services to the wants and needs of their community. Welbi also helps the community foster better relationships and communication between staff, families and residents. Each one of our team members has experienced difficulties when caring for an at-risk family member. We have all sought a solution for our loved ones and have fallen short. As a result, our passion and expertise have driven us to solve this problem ourselves. We were inspired to create Welbi not just for us, but for the 52 million other families in North America that are struggling to provide care to their aging loved ones.